Shower trays are great. They ensure that water gets drained properly, they stop water from spilling out onto your bathroom floor, and their container-like appearance helps to keep your bathroom look better organised by providing you with a designated area in which to shower in. They are also pretty resilient, and are designed to withstand all sorts of weight, fluids like shower gel, shampoo and conditioner, and of course they help to prevent us from slipping or falling down in the shower. But after a while, our humble friend, our shower trays get dirty from constant, daily use. Every so often, they will need a bit of tender loving care to get them back into showroom condition. In this blog we discuss the ways that you can make your shower tray look like new again using some simple but effective cleaning methods. What is it that Stains my Shower Tray? There can be many reasons why your shower tray can get stained and dirty. Most commonly, alkaline in the water from the shower, the soap you use, and even your shampoo and conditioner can cause the stains. Other likely suspects can also include any mould or mildew, caused by stagnant water (mostly due to a lack of ventilation in the bathroom – opening the bathroom window whilst your shower helps to cut this problem down significantly). Apart from making your shower tray look manky, old and horrible, the stains are also unhygienic and can potentially be bad for your health. Products such as HG Mould Spray are highly effective at combating any mould or ingrained stains on your shower tray. You simply spray it on your shower tray, leave it for about half an hour, after which time you use a wet sponge to wipe off the spray and then rinse your shower tray out. It is also perfect for use on your shower tiles and grout, and on the silicone that is used to seal your shower tray. Like with many chemical products that are used in the home, it is advisable to leave the window open in the bathroom so that you can allow the room to ventilate as it does have a strong smell. Bleach is one of the most commonly used cleaning products in our homes, and the cheapest as well – supermarkets often have 1 or 2 litre bottles of bleach on offer for prices as low as 50p! Before you start cleaning your shower tray with bleach, make sure that you are wearing clothes you are not bothered about (in case any bleach that comes into contact with them dyes them), and that you are wearing rubber gloves. Block the shower tray drain using a plug or similar, and mix a solution of bleach and hot water in a small bucket according to the bleach manufacturer’s instructions. Pour the bleach and hot water solution onto the shower tray and leave it for about half an hour. As with solution 1 above, ensure that the window in your bathroom is open to allow the area to be well ventilated. 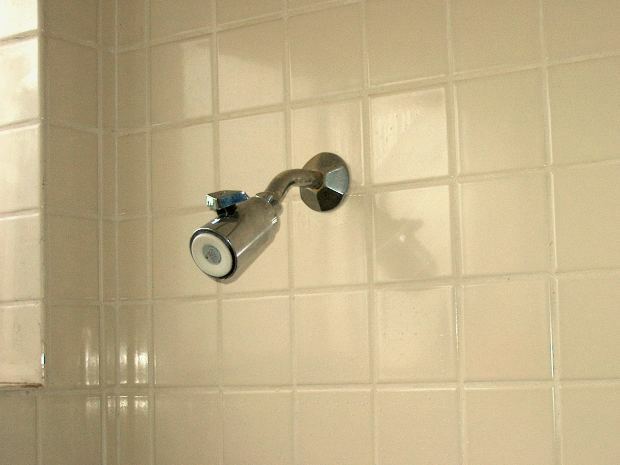 When you’re done, unblock the drain hole and rinse the bleach away with warm or hot water using the shower. There are also other solutions available such as vinegar, however this requires a moderate amount of scrubbing whereas the other two solutions shown above can just be left to soak the tray and remove any stains and mould.